Starting with one arm forward, one at the shoulder, alternate “punches” from the shoulder while maintaining a stable kneeling position on the Swiss Exercise Ball. Objective is to try and maintain a stable position on the exercise ball with as little movement in the torso as possible. Also keep the shoulders from elevating while punching. 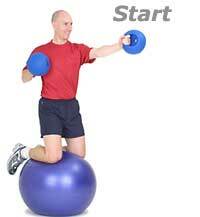 Swiss balls are large, heavy-duty inflatable balls with a diameter of 45 to 75 cm (18 to 30 inches). The Swiss ball is also known by a number of different names, including exercise ball, gym ball, Pilate's ball, sports ball, fit or fitness ball, stability ball, therapy ball, yoga ball, balance ball, body ball, or birth ball. 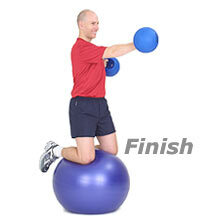 Swiss balls offer you a fun, safe and highly effective way to exercise. How Do Swiss Balls Improve Balance?